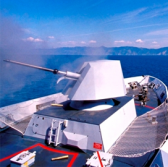 Leonardo has tested the resilience of its naval gun weapon system to cyber attacks as part of an extensive vulnerability assessment effort. The company said Tuesday it evaluated the OTO 76/62 Super Rapid gun to identify potential system weaknesses and implement measures to address identified cybersecurity risks. During the evaluation, Leonardo explored attack scenarios that involved voluntary and accidental actions such as malware and virus introduction through removable devices. The assessment also demonstrated the system’s compliance with security standards established by the National Institute of Standards and Technology and International Organization for Standardization. OTO 76/62 SR’s gun console is equipped with a multifeeding device and designed to manage weapon components such as the Strales targeting system for Dart sub-calibre guided projectiles or the Vulcano ammunition technology.